According to Craig Chase from the Leopold Center for Sustainable Agriculture at Iowa State University, you can net $1 million a year from 80 acres of certified organic land. Yet to many organic producers, money is not the goal. The light is the way of life, the experience of labor to produce good food, being good to the earth, and having an occupation you feel good about when work doesn’t feel like work…..it’s living a good life. 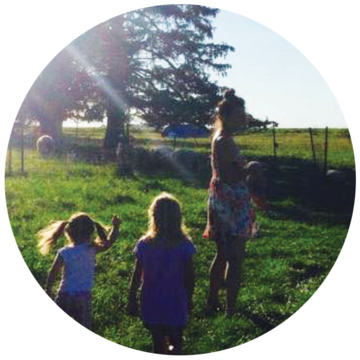 On our journey to learn and begin to practice organic agriculture, we have been lucky enough to team up with the Frantzen family as our mentors. The Frantzen’s farm 385 acres of row crop and small grains for forage as well as pasture graze a cow and calf herd and raise outdoor hogs. 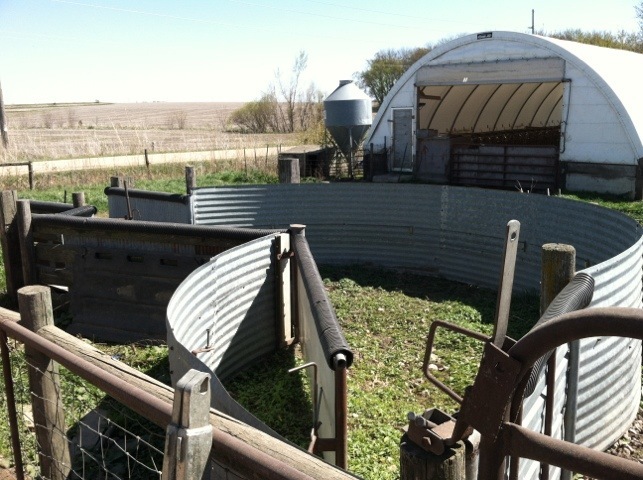 Their system is fully sustainable, utilizing the fertilizer from the animals to spread on the land to grow bountiful crops to then feed their animals, and the cycle continues. 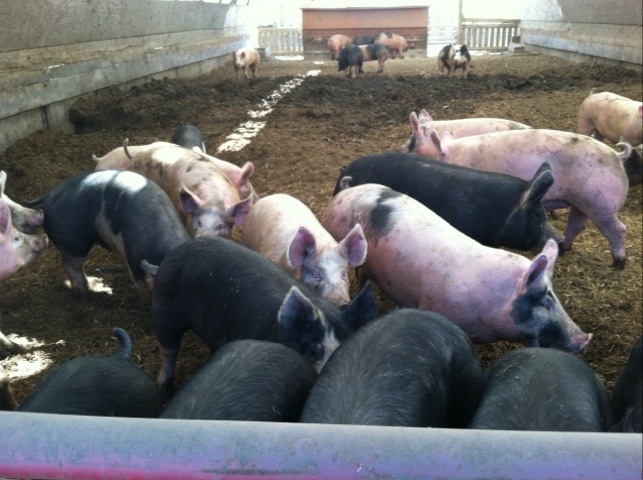 They make their profits by selling hogs and calves through a price contract with Organic Prairie, as well as selling any extra organic soybeans, corn, or small grains they do not need to feed their animals. This year as mentees, it is necessary that we visit their farm every month to see the changes with our own eyes. We are learning about their 4-7 crop rotation method, raising organic livestock, the labor needs to weed and feed their crops, and their lifestyle and economics as organic producers. We are very blessed to have one organic producer nearby. We are not near any large metropolitan areas where organic products are cherished, but we do see a slight upward movement in 30,000 population towns such as Mason City, where consumers are becoming more and more aware of what their food contains, how it is grown and an increase in organic produce consumption. I like to use the verbiage micro vs. macro, micro representing the small farmers who produce little but high quality food, macro representing the large farmers who produce a lot of food but need a lot of inputs to control weeds and pests. What they grow goes toward a larger scale of production for bagged and boxed foods and over processed meats, and there is still a desire for these products, but a shift in weight is happening. To many in denial, the U.S is moving toward the micro food system and it’s coming toward a small town near you! I will provide updates on my blog each month from each Frantzen visit so you can see the changes for yourself. The April’s visit entailed a farm tour, what they have planted or are going to plant on each field as part of their rotation, manure management, an explanation of their farm equipment, and their livestock care and management. 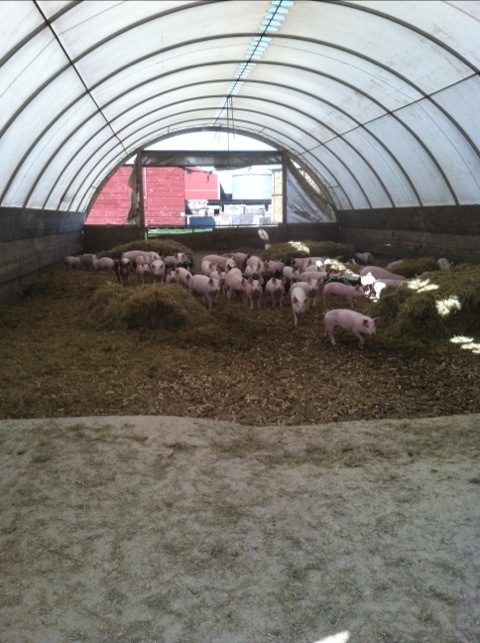 Weaned piglets in an open air hoop building. They harvest corn on the ear, shuck it on site and keep their cobs for an excellent bedding alternative. 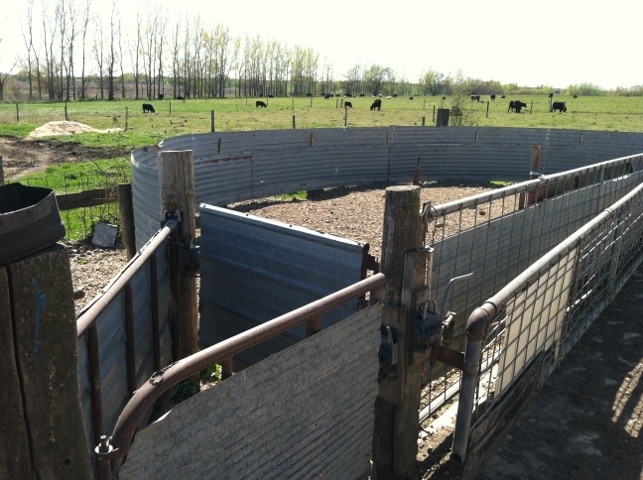 A Temple Grandin designed livestock separating shoot for a more humane experience when hogs are loaded onto a truck for transport. Machinery row. 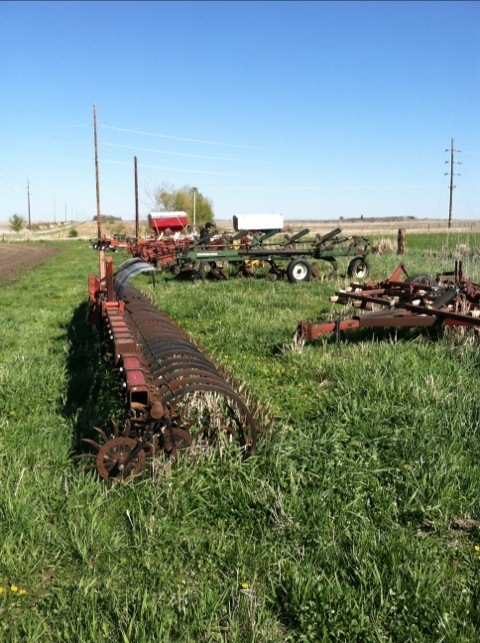 Flame weeders, row cultivators, crushers, hay elevators, grain drills and more!